Huay Kwang Thai Mookata @ Thomson - S$19.90 buffet & special sets on promotion! Huay Kwang Thai Mookata is best known for its authentic use of charcoal in the cooking, just like the original Thai version. 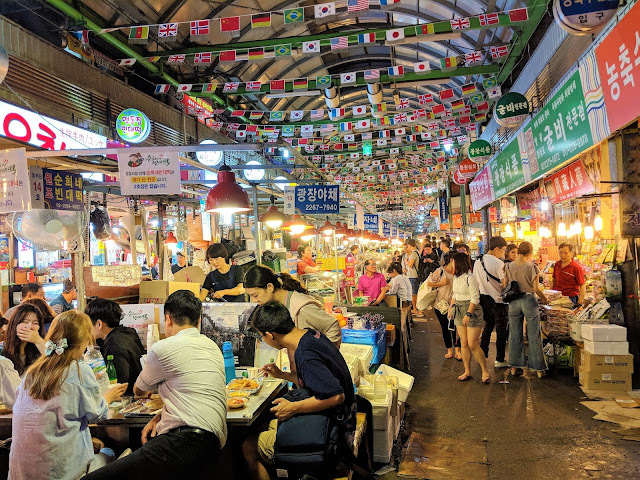 It is opened until 2.00 a.m. daily and if you do not know where to go for SUPPER, head down to HKT for beers and meat. 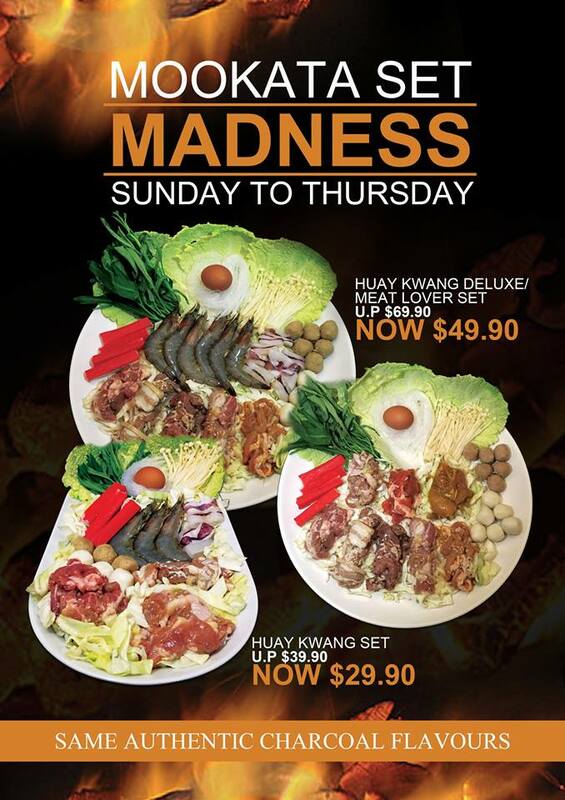 For hungry meat lovers, it also has an Ala Carte buffet for as low as S$19.90! This is the third time I am eating Mookata and by far, the most delicious. The indoor air-conditioned seating area was very popular after 7.30pm on a weekday. The beauty of Mookata is that the meat and seafood are cooked on a dome shaped grill, allowing the natural flavours to flow into the surrounding soup. Click on the video link for Huay Kwang Thai highlights! I did not go for the buffet because I am unable to whack a lot of meat in one session and I also would like to include some seafood in my Mookata meal. The Huay Kwang set is perfect for us! The Huay Kwang Set consists of the house pork collar, pork belly, marinated chicken, prawns, squid, meatballs, fish balls, crab sticks, vegetable set and fresh egg. The portion was generous and the set was meant to feed 2 to 3 people. The seafood looked fresh. I am a seafood lover and I was very pleasantly surprised that the additional Seafood Set consists of abalone and bamboo clams! I would definitely recommend adding the Seafood Set because for less than S$20, you get scallops, clams, prawns, mussels, abalone and bamboo clams. They tasted delicious especially when dipped in their homemade sauces. The Thai Ice Milk Tea is a Must Try! It resembled those that I had tried in Bangkok - thick, well-balanced and very fragrant. After the tea, order some beers to go with the food as we need something cooling and refreshing. The original Thai version also uses Pork Lard to oil the grill. I love pork lard for its aroma. The chilli sauce was excellent. It was tangy, spicy and very Thai. I also loved the garlic in the sauce. I dipped my cooked vermicelli in the chilli sauce and it really reminded me of the Thai Vermicelli dish! Very nice! The Thai Fish Cakes were very delicious and worth ordering because I love lemongrass and this fish cake had a nice hint of lemongrass flavour. Thumbs up! The seafood tasted fresh and especially delicious when dipped in the tangy chilli sauce. I also loved the taste of the marinated meat. It is a taste that I will go back for. I like to try new things and I was very happy to see bamboo clams. Be sure to dip the seafood in the sauces provided! For Buffet lovers, Huay Kwang Thai charges S$19.90 on weekdays and S$22.90 on Friday, Saturday, Sunday, eve of Public Holidays and Public Holidays. I am really delighted that Huay Kwang Thai has quite a number of options for additional sets. I really enjoyed the Huay Kwang, Seafood and Thai Fish Cake sets. Huay Kwang Thai is having a promotion on its sets from Sunday to Thursday. The Deluxe and Meat Lover Sets are meant for 4 to 5 pax and the Huay Kwang Set is meant for 2 to 3 pax. Do check out their Facebook Page for more updates on their promotions! Huay Kwang Thai has both indoor and outdoor seating areas. On a weekday, the indoor seating area was very popular after 7.30p.m. Overall, the experience has been fantastic and I cannot wait to be back to dip the yummy meat and seafood in the chilli sauce! Please note that the Maude Road outlet (near Jalan Besar) is closed. Don't forget to share my post with your Mookata friends and click Like on my Facebook Page for more updates. P.S. I especially love the Thai music played in the restaurant. Bangkok, I miss you!